Reviewing requires the investment of time and a certain skill set. Before you decide to accept a request to review, you might want to know more about the peer review process and how to conduct a review. You can also check out some of the free e-learning modules, tools and resources on Elsevier Researcher Academy. Reviewers evaluate article submissions to journals based on the requirements of that journal, predefined criteria, and the quality, completeness and accuracy of the research presented. They provide feedback on the paper, suggest improvements and make a recommendation to the editor about whether to accept, reject or request changes to the article. The ultimate decision always rests with the editor but reviewers play a significant role in determining the outcome. Reviewing is a time-intensive process – writing a review report can be almost as much work as writing a manuscript! – but it is very worthwhile for the reviewer as well as for the community. ensure the rigorous standards of the scientific process by taking part in the peer-review system. uphold the integrity of the journal by identifying invalid research, and helping to maintain the quality of the journal. fulfil a sense of obligation to the community and their own area of research. establish relationships with reputable colleagues and their affiliated journals, and increase their opportunities to join an Editorial Board. can help prevent ethical breaches by identifying plagiarism, research fraud and other problems by dint of their familiarity with the subject area. reciprocate professional courtesy, as authors and reviewers are often interchangeable roles – as reviewer, researchers "repay" the same consideration they receive as authors. Typically reviewers are invited to conduct a review by a journal editor. Editors usually select researchers that are experts in the same subject area as the paper. However, if you think you would be a good reviewer for a specific journal you can always contact one of the journal's editors and volunteer your knowledge. Please take into account that since the launch of the “volunteer to review” initiative, many journal homepages offer this possibility through a registration form (for example see here). If you already have reviewed for any Elsevier journals in the past, you can also volunteer to review for a journal of your choice from your Elsevier reviews profile. Be aware that the choice of whether or not to choose a particular reviewer for a paper is entirely at the discretion of the editor and Elsevier plays no part in this decision. The time, energy and expertise that reviewers contribute to validating the work of their peers is vital to the advancement of the academic community. Elsevier’s reviewer recognition platform provides reviewers with a means of publicly showcasing their efforts and receiving credit for their work. The platform offers reviewers a personalized profile page, documenting their reviewing history. If a reviewer has completed at least one review, they become a "recognized reviewer". Editors can also personally select and recognize reviewers who have submitted high-quality reports and award them with a "certificate of excellence" and other perks. Reviewers can download review certificates, end of year review reports and electronic signature via the platform. 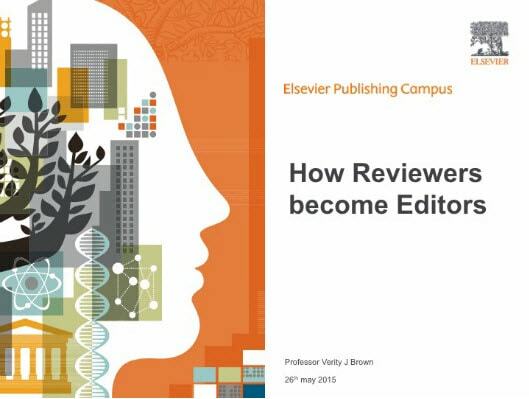 Reviewers can also volunteer to review for their favourite Elsevier journals. We regularly survey reviewers to get a better understanding of their needs and how we’re doing when it comes to meeting them. Findings from the reviewer feedback programme help us to improve the reviewing experience. For example, 90% of reviewers said they would like to be able to see the final decision and other reviewers’ comments on a paper, so we added this functionality to the electronic submission system. The reviewer feedback programme monitors Elsevier’s performance from the perspective of reviewers on Elsevier journals. We’ll ask you about various aspects of the reviewing system and other aspects of reviewing via an online survey. Areas of interaction and support are measured and reported regularly. Elsevier’s performance is benchmarked against that of other publishers.